We offer buttress plate which is made using best quality raw materials. Our buttress plates are durable and reliable. The quality offerings have earned us reputed clients. We provide these plates at market leading rates. We offer a wide range of superior quality T Buttress Plates. 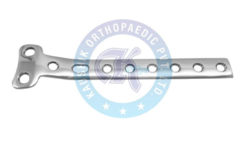 It is used primarily for lateral or medial tibial plateau frx, apart from being used as volar barton’s frx and proximal humerus fractures. 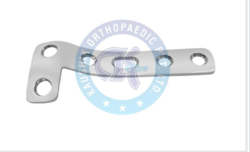 Moreover, by the means of applying axial compression from a pr-contoured plate, these can also be used to provide support to the cortex of a metaphysis from crumbling or displacement. All these products are manufactured under the able guidance of our technical and professional experts, thus, adhering to the various industrial standards. These are available in various sizes and designs to meet our clients’ specifications and are effectively priced.